I’ve done it, I’ve signed up. I have followed with interest people taking part in Me Made May each year. This year I’ve signed up. This is a copy of my pledge. I will be including knitted and sewn items, and handbags do not count! I have been quite productive making clothing recently but to keep up the motivation I have included the challenge to make another two items. If you want to join in, following the link to So Zo and pledge your commitment in the comments. Its been an eventful Easter weekend. Fabricland were running a 15% discount promotion on Good Friday and Easter Monday. 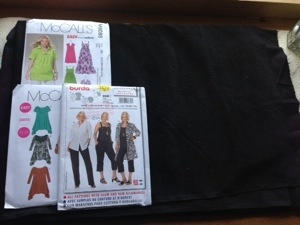 I went on Friday with my mum and a friend, and brought a couple of patterns and a selection of jersey. I also brought a couple of meters of needle-cord. The plan is to make a number of tops. 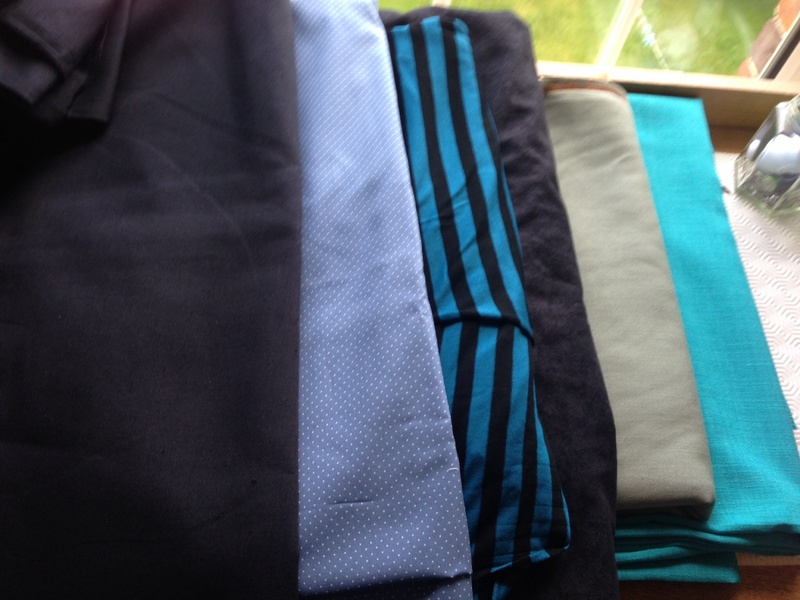 It wasn’t until I got home that mum mentioned there were some linen blends so I went back on Monday and spent some more money. Monday focused more on linen, cotton and suedette. 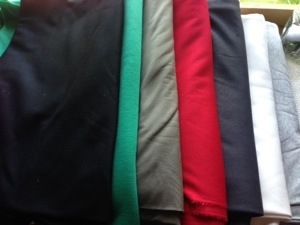 The linens and cottons will become summer dresses and skirts. I brought one poly-cotton to use as a muslin for shirt making. Ready to wear shirts are always too tight across the bust. The suedette will be come a long skirt. I really want to make this now however the summer outfits are going to be more useful for now. For the crafting part of my weekend I finally finished off a dress and made a cardigan. 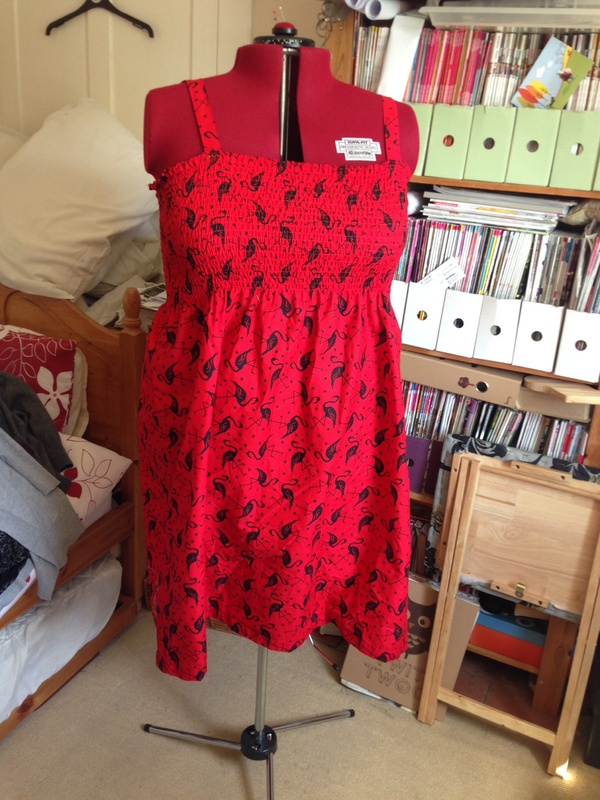 I started my red and black flamingo dress last year to take on my holiday. halfway through the shirring something broke in the bobbin area of my beloved Brother BC-2100. Despite my best efforts I could not fix it before I went away so it sat in the WIP pile. After a few months of tracking down the right part I still could not get my machine to work. I invested in a brand new Janome TXL607 and immediately finished the shirring. The dress then got put aside at it was the middle of winter. All I had to do was add the straps and it was finished. This happened on Saturday, and the nice weather disappeared on Sunday. Its all ready for the next sunny day. I have also sewn a cardigan. I brought a black knitted woolen fabric from a company called The Shuttle whilst I was at the NEC for the Sewing for Pleasure show. I intended to make this in to a waterfall cardi from the moment I brought it. The pattern I have used is Lekala Cardigan 5867. Lekala.co is a Russian company that create sewing patterns to your measurements. This is the second pattern I’ve used of theirs and it fitted almost perfectly. Its a very simple pattern. A back, two sleeves and two fronts. It was sewn completely on my overlocker and took no time at all. 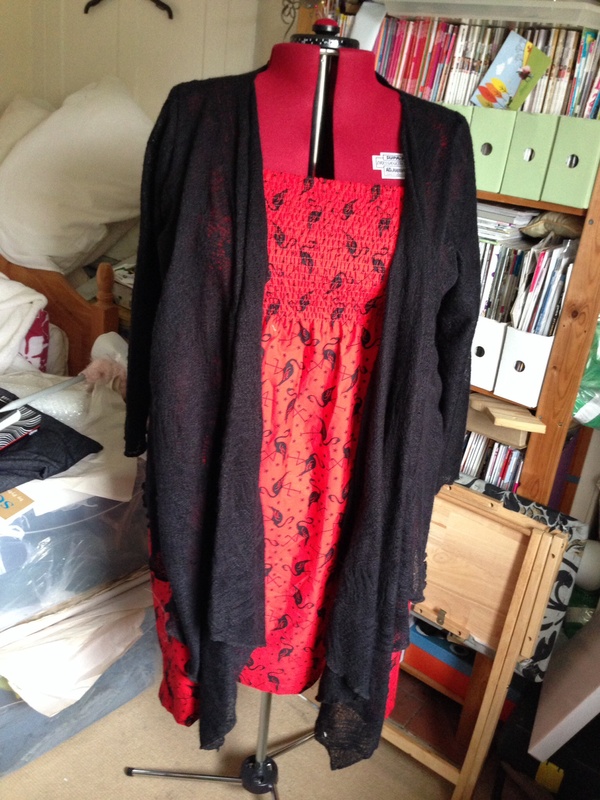 I edged the whole cardigan on the overlocker too. This takes care of my April garment. I haven’t quite decided what my May project will be. The knitting and the spinning are still stalled. I am very aware I only have a week left to finish my spinning goal. I will try to get this done on my rest days. If I wasn’t so tired I would be able to get some knitting done during my work meal breaks. Until I’m sleeping well enough, meal breaks are still used for snoozing. Its been a while since I updated this and I really do not know where the time has gone. Whilst going back to work has limited my crafting time I am still managing to fit some in. I’m going to start with what I haven’t been doing, Spinning. I now have a good stash of fibre and I was lucky enough to get a blending board and a jumbo flyer for Christmas. I have so many plans for the yarns I want to spin but this always seems to go to the bottom of the list. I am going to try and finish my black and mallard by the end of the month. At the moment the singles for the mallard, and one single for the black is spun. I still need to spin one black. I then plan to ply the mallard and the black singles separately, and then ply the two colours together. Elijah. An extremely cute elephant softie designed by Ysolda Teague. I’m knitting him in Amy Butler belle organic dk shade 15. At the time of writing I have completed the head and started on the body. I’m hoping to have him finished by the end of the week so I can take him on my trip north in time for my sisters birthday. Cable and lace shawl. This is one of my designs. I completed a small version of this as a Christmas gift and I am now working on a larger version. This sample is being knitted in Easy Knits Twinkle DK and the shade is Crushed Charcoal. Its a lovely yarn to work with. This is one of two patterns I plan to test and release this year. Gra’s Socks. I first made Gra his first pair of socks in 2009. Since then he’s been through a number of pairs. These socks are ones I have designed just for him. They are made in a chunky yarn with a 2×2 rib pattern. I haven’t been happy with the heel on previous pairs and as a result I am making this pair with an improved heel. I also plan to test and release this pattern this year. There isn’t much to tell about the sewing. I’ve not done much recently and I plan to change that. I have made two more skirts since my last post, a long denim skirt and a shorter corduroy one. Both are work, but I seem to be living in the denim one. I’ve been reading some sewing blogs and come across this one where the participants are attempting a garment a month. Its certainly been an inspiration and I will be making some tops and some more skirts. Hopefully by my next post I will have some items to share. 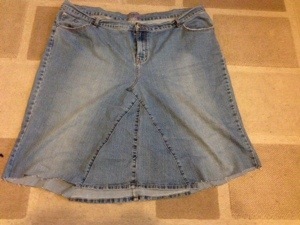 Yesterday I started to make a denim skirt from an old pair of jeans. I did not take a before picture but I am very happy with the result. 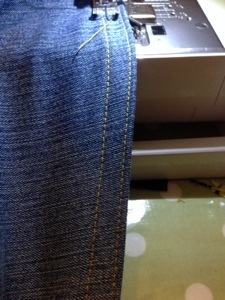 I folded over the legs so the bottom of the jeans were level with the bottom of the fly. I the cut along the folds. I unpicked the inside leg seams. After a bit of tidying the edges the gusset was sewn flat. After unpicking one seam in each leg, the opened legs were sewn in to the gap front and back. The seams were then overlooked and the hem pinned. I hemmed the skirt with a double band of stitching. 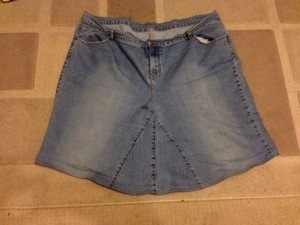 The skirt was then finished. It’s very comfortable to wear and will get more use this way. 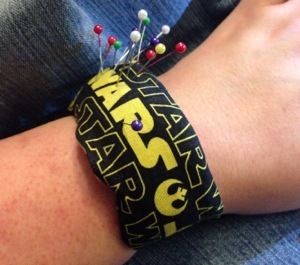 I’ve also whipped up a wrist pincushion using some fabric scraps and a bit of elastic. I’ve tried blogging In the past. I even managed to keep it up for a month or two. What’s different about this time? Nothing, something, everything? I make no promises about my frequency of posts. To start with this is for me. It is somewhere to host all my crafts. I love Ravelry for my fibre crafts and I’m starting to love threadbias for my sewing. Both sites are great in their own way but here is my own little space. I want to design, I want to publish. I want to have the motivation to finish my patterns. I have some I’ve been working on and should I complete them I want to use this space help promote them. Until that time these are my crafty adventures.